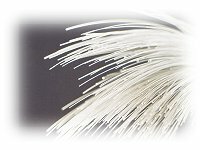 Since our foundation in 1947, Hinode Wire Mesh has been expanding into the wireworking sector, which covers versatile applications, among other metalworking sectors, and manufacturing wires and wire meshes that play important roles in fields ranging from social infrastructures to living wares. We sell products as well as work together with users to develop the manufacturing of coated wire and wire netting. We have attained high achievements and reliability as a total wire mesh supplier to address every need concerning wire meshes through our prominent creativity, technological skills, and productivity.